This week's contribution to Illustration Friday's challenge "Choose"
..the fork in the road. I was on the road less travelled when I came upon a sign that read, "Fork in the Road ahead". The road meandered for some time past this sign, I'd say about 1/4 mile or so, when all of a sudden there was a fork in the road. Now this was no ordinary fork in the road, like you read about...some diverging path. This was a real fork, the kind that would complete your table setting. What do you suppose this meant? Was this fork a metaphor for something in my life? There it stood firmly planted in the ground with four shiny metal tines, were the tines representing the parts of my life I needed to acknowledge? What would I see next, a spoon, or a knife? Was this to remind me that I am part of a set? Am I looking to complete myself, would I be made whole? Would finding a spoon feed my soul? Would the knife cut my journey short? ...so many questions on the road less travelled. I am a non-conventional thinker. I will continue on my journey, welcoming change, mixing things up, looking for new interpretations of the old . I will relish the opportunity to take more chances, for the only regrets in life we have, are the chances we never took. for making me think, for this I am grateful. 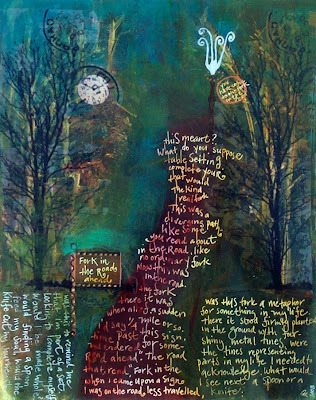 Sue O'Kieffe and John Mora Typos.Daylight.Fate have recently begun to collaborate on some of their creative efforts. John's original image "stay" can be viewed here where he sampled a lovely photo from Babaloo here. 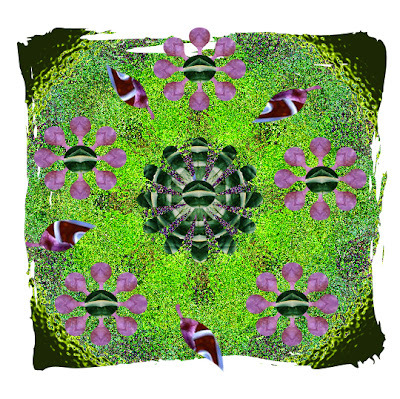 Sue's mandala, is a collaborative work with John can be seen is here . Thank-you to Great Grannie Bobbie for suggesting this round robin challenge. "No images have been hurt in this creative exercise, only my ego as I struggle to learn the tools"
Have a wonderful day! 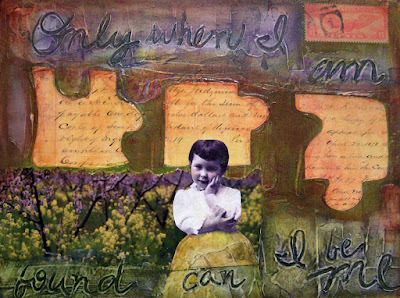 My other blogspot: "The Way I See It"
pre-gesso'd black journal paper, Golden Fluid Acrylics- Interference green and gold, Cobalt Blue,Quinacridone Magenta, and my favorite Nickel Azo Gold acrylic paint on asian stamp for initial background texture. The rats are cut out of paper towels I had used to clean my brushes and saved. chinese coin stamp and asian lady stamped with Stazon black on acetate. My contribution to Wednesday Stamper's theme for this week "Asia"
Happy Chinese New Year! 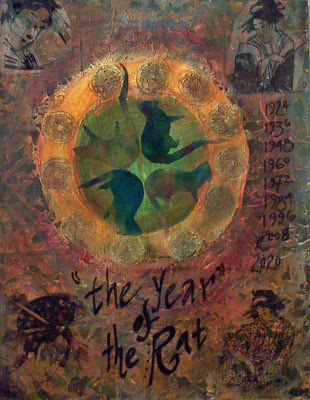 "The Year of the Rat" note the years listed on the right on my collage are 'rat years', which occur every twelve years. Right now I'm thinking my husband is a rat, but now he was born in '61. Is it possible to be on the cusp of rat? This city girl, (who now lives in the country) is pining for her husband who abandoned her early this week for another country, not another woman, but another country. Italy. 'Povero Bambino!" This is where the *fink* part comes in as in *rat fink*. and he took our good digital hence crappy photos. I needed to drown my sorrows, so I decided to mosey on over to the Barrel Room a local vintage wine bar and bistro to meet some friends. Here I opted for the 'champagne and caviar dreams package' a.k.a. glass of "J" Cuvee from J Winery in Sonoma. We cracked some bread, peeled back some prosciutto, and nibbled on baby lamb chops. We laughed, we people watched, and we laughed some more and I still wasn't feeling like I was any where nearer to the Trevi Fountain. Another "J' please, and can I buy a vowel? Like a "U" for u rat fink. I'm just joshing because I'm actually delighted my husband had a chance to get away to such a lovely place and have it paid for by the company. So city girl heads back home to country, tired and lonely for her traveling man. Now mind you it has been raining alot up here this past weekend, it's been frigid cold in the a.m. 27 degrees with frost all around. Our yard backs up to the Cleveland National Forest, (no we don't live in Ohio) and the wildlife is restless. Our little birds are tapping on the bedroom windows, I'm feeling like Tippi Hendren in "The Birds". There are the frogs, what sounds like meeeelllions of frogs, croaking away, pining for bug bites, coyotes pining for the moon, and the barn owls that nest in our trees pining for the rats! So I cozy on up to the sounds of my wildlife friends and ring in the New Year. P.S. 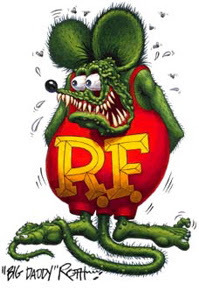 Here's a real pic of Rat Fink (anyone remember this hot-rod character by Ed Roth) from Kustom Kulture. My husband used to have these trading cards. 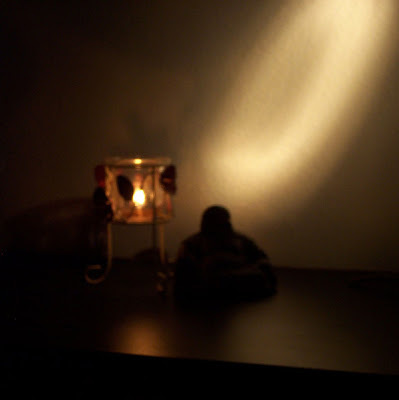 "Enjoy yourself it's later than you think"
My other blogspot: The Way I See It"
My contribution to this weeks 2things challenge Night/Light. "Enlightment must come little by little---- or it will overwhelm us." My contribution to this weeks Wednesday Stamper challenge "Charms"
"No man is useless, while he is a friend" Thanks for stopping by!